Schloss Dürnstein was built by one Christoph Wilhelm of Zeking in 1622-1630 and sold in 1663 to the duke of Starhemberg, a defender of Vienna against the Turks and famed ancestor of one of Austria’s oldest and most noble families. In 1937, the Theiry family acquired the property from the Starhembergs and opened it as one of the finest hotels along the Danube. One of the area’s most illustrious and reluctant visitors was Richard the Lion-Hearted of England, who was imprisoned in the castle above from 1192 to 1193, while he was on his way home from the Third Crusade. His exact whereabouts unknown, his faithful servant, Blondel, began visiting castles throughout Germany and Austria, singing Richard’s favorite song at nightfall in hope of a response. At Dürnstein his song was answered. It’s said that the money paid for Richard’s ransom helped build the walls of Vienna. Dürnstein is a magical little village, well worth spending a few nights in. After the day trippers leave in the late afternoon, you can stroll the cobbled road from one end of town to the other in relative peace. 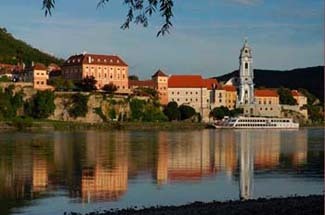 The Wachau region of Austria is now on UNESCO’s World Heritage List—deservedly so. Apart from the drop-dead beautiful scenery, there’s quite a lot of fun to be had. Be sure to visit the local Heurigens—local wineries that serve their own wine and home-cooked meals. You can spot them by the wreaths or branches on the front door. The Wachau is also known for its apricots; try its famous apricot liqueur. Rates include tax, service, and buffet breakfast. Trains leave Vienna from Franz Josef Bahnhof; change in Krems or take taxi. Boat from Vienna on Sundays during summer. Yes. Inquire hotel for details. Traveling on a paddle-wheel steamer up the Danube is one of Austria’s best experiences. Mile after mile of forest- and vineyard-covered hillsides dotted by castles pass before your eyes. At one turn in the river, the idyllic town of Dürnstein comes into view. Flowers cascade from the balconies of 500-year-old houses, and a baroque church tower marks an ancient monastery. When your boat pulls up in front of a golden-hued Renaissance palace, you’ve arrived. Public rooms at the Hotel Schloss Dürnstein are appointed with gilt mirrors, oil paintings, Oriental rugs and antiques, including the white ceramic stoves typical of grand Austrian estates. Guestrooms range from the small and simple to the large and ornate. For a splurge, stay in the Prince’s or Baroque suite, which features carved ceilings, antiques, chandeliers, and blissfully comfortable feather beds. Dürnstein is one of the most romantic villages in Austria.